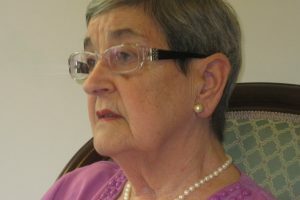 Marie joined the Board of Jessie Street National Women’s Library as Treasurer in 1995 and remained on the Board until 2014. Her support for the Library dates back to its founding in 1989. She was drawn by the concept and had long admired Jessie Street for her political work as a feminist, internationalist and Aboriginal rights activist. Marie was born in 1930, the youngest of five children. Her mother’s family was descended from a convict transported to Australia and her father emigrated from Montenegro in 1903. She attended Sydney Girls High School and Sydney Teachers College. Her first teaching appointment was to Auburn West Primary School in 1950. Her non-Anglo surname — Jovanovich – exposed her to some unpleasant experiences as a young student. The lesson she took from this was to reject negative discrimination in all its forms throughout her life. She was transferred to Scone District Rural School in 1952 and eventually married Ken Muir, who taught Industrial Arts at the school. She described this as a good partnership and friendship that endured for her lifetime. They campaigned together and they inspired each other. Above all, they cared deeply for each other. Marie brought to the Library a broad range of exceptional professional and personal qualities and vast networks. She insisted on democratic decision-making and due process in her distinctive and commanding voice. She had the welcoming warmth of a woman who affirmed the skills and talents of others. She embraced volunteers and made them feel their contribution would be invaluable, however small. Her most public and extensive role with the Library was as convenor of the Annual Luncheon Committee. She excelled as MC at each function, playing the role with vibrancy and ease, encouraging guests to acts of generous giving over many years. This built the support base of the Library and ensured its financial stability. She had an instinct for working well with people and around them. Everyone felt valued. Marie was humane, inclusive and respectful. She was a fighter for better public education, equality in the teaching service and many social justice causes.